• App Analytics & User Acquisition reports :chart_with_upwards_trend:New! 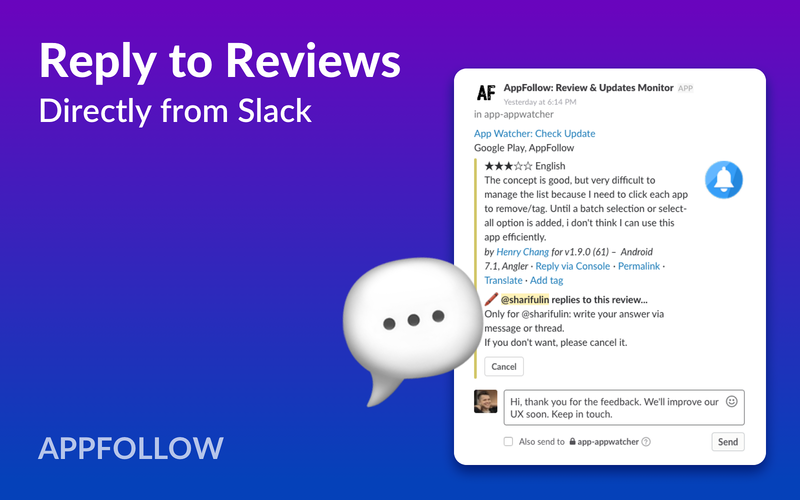 Reply to reviews directly from Slack.You can track any app in the appstores, compare and learn your customers needs & wishes. 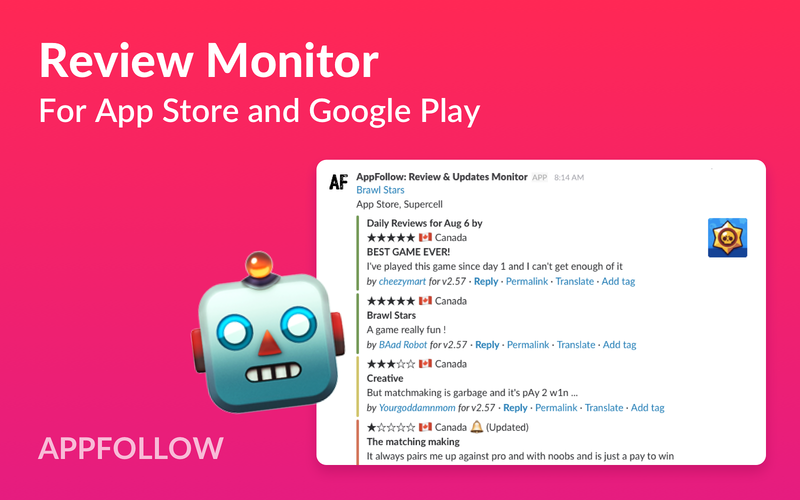 Review notifications, reply to Google Play reviews directly from AppFollow account, get translations, keywords & ranking changes tracker, monitor ASO results.AppFollow as well supports sales & downloads reports for your own apps. Also you can add integration with AppsFlyer tracking system and Search Ads to monitor your ads campaigns directly in Slack (we support daily & weekly reports). More tracking system integrations are coming soon. 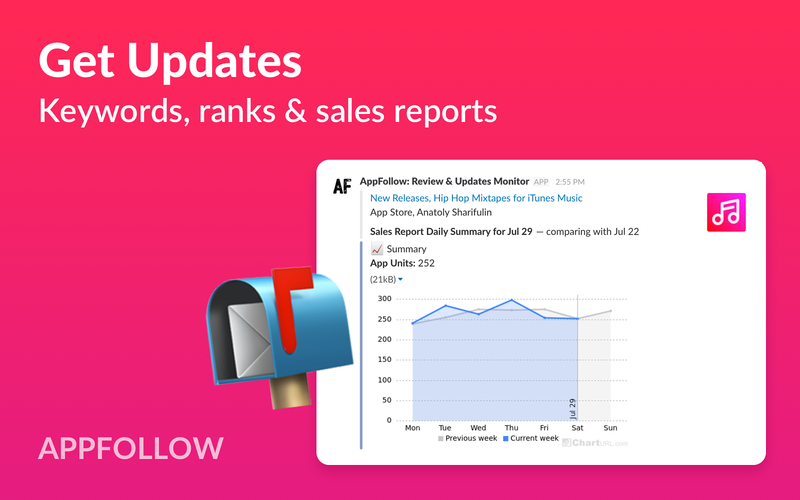 :robot_face: @appfollowbot can help you stay updated on what is trending, top-charts & keywords suggestions for App Store and Google Play.AppFollow helps iOS, Android and Windows developers stay updated. All important information for each team member in one place.P. 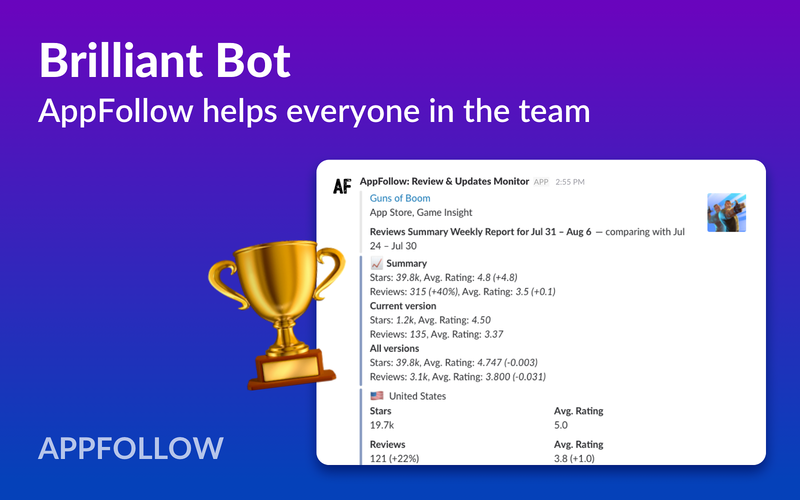 S. AppFollow is nominated for a Golden Kitty Award in the Bot of the Year on Product Hunt :heart_eyes_cat: and Brilliant Bot in Slack App Directory. 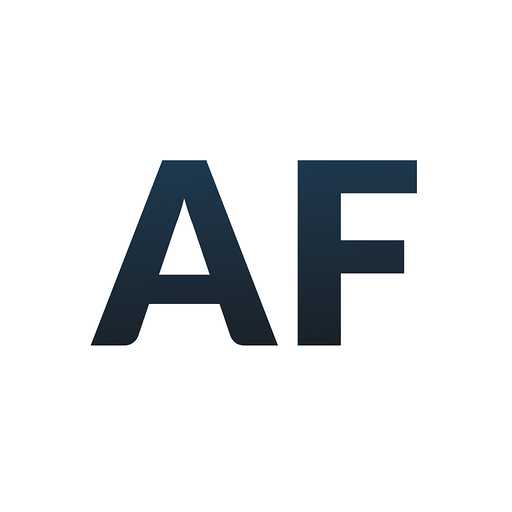 AppFollow: Review & Updates Monitor will be able to post to specific channels in Slack. AppFollow: Review & Updates Monitor will be able to send messages to your workspace. AppFollow: Review & Updates Monitor will be able to install a bot user that appears in and has access to your workspace’s directory. It can also post messages and view activity on messages in any channel it is invited to.